filling different products in the same bottle. Polaris Automazioni has always been known for the flexibility of its solutions, implementing integrated systems for mixing different liquids in the bottle (such as oil + vinegar) in different quantities, or adding solids to the bottled liquid (such as oil with pieces of truffle, with dried chilli peppers, rosemary or other herbs, or grappa with frozen bilberries, etc.). Separate batching systems are fitted for liquids (including dense liquids like glazes) or solids. 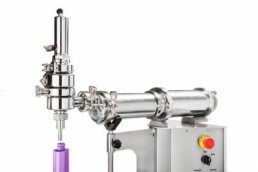 located on the line downstream the filling unit, it is fitted with 1, 2 or more piston volumetric dispenser nozzles that can be loaded with different products. The amount of product to be added is easily adjusted using the flywheel and associated counter, available on the rear of the machine. Solids can be batched by number using the vibrating channels fitted with optical sensors (for pieces of truffle, dried chilli peppers, frozen bilberries etc) or by weight using loading cells (for rosemary, spice flavourings etc). Both systems can be fitted on the same batcher. The batch feeders are integrated within the Monobloc bottling line, in addition to the filling unit for the main product. The machine keeps the same features as the basic Polaris Automazioni system, with the addition of this option to mix several products in the bottle.